I have been reading over several threads regarding Parallax’s ESP8266 WiFi board, and I am looking to find a bigger, badder WiFi module. -MUST be ESP. I like them. -Must be capable of having firmware modified easily, via either serial or WiFi. -Must have a large RAM, 32kb whereabouts. I would like to have a quick learning curve, and to be able to find an IDE to flash modified firmware. If the Parallax firmware from the 8266 could be used, bonus. Big bonus. 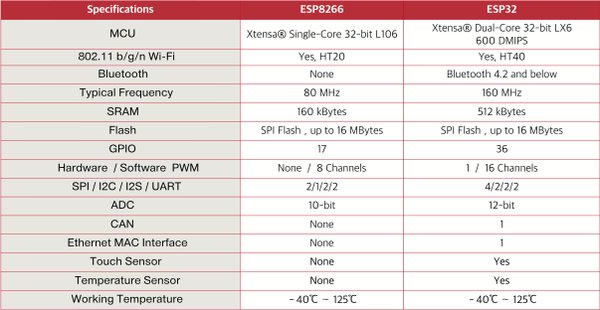 What about the ESP32? It has 520K of RAM. I believe I have a developers module here originally made by Adafruit. And naturally I've not had a chance to do anything with it. As for the basic ESP8266 widget, I've been trying to figure out how to make the ones I have here to do something with them. They do sell the same modules that the Parallax one is wearing, you are also free to snag one or two or three, and attempt to work out what's what, and who's who with the thing, and make that one work for you. And this message is being sponsored by the Astromech droids for better starfighter pilots union. I’ll have a look at the ESP32. You guys said it comes in an identical package that the Parallax module wears? Research yields multiple versions. Which one is most powerful? https://github.com/watterott/ESP-WROOM-Breakout (parallax seems to use the esp-wroom-02 module). Software wise you should be able to get the same code to compile for esp32 and esp8266. Not sure for the parallax code, @David Betz might know more here. One core, two core, etc. checking out your links now. Have updated thread title, now looking for firmware, tutorials, etc with ESP32 in mind. Thanks @rosco_pc, @David Betz, and @Buck Rogers! It would be ideal to target the esp32 for the official wireless chip and board for programming the p2. This would get a more secure sdk in use. Tons of work involved in that though. Updating of all parallax code to new versions, I.e. the P2 era of tools, compiler versions, etc.. I think the esp32 SHOULD definitely be at the top of the list for tools to develop for/with the p2. So getting to that point again with the esp32, running parallax firmware, is another mountain, if you want to use all the latest firmware/code/esp sdk. Maybe Parallax could make a board for the ESP32, something like the Adafruit Feather. And this message is sponsored by the Anarchists for a freer society bowling league. Use the free B4R to develop ESP32 firmware. Confuses me. What exactly is B4R? Take a look at the site. Let's just say its almost an improvement over the methods for the ESP8266 and the ESP32 via the software from that site six doors down. I'm probably going to snag a couple of ESP32 boards from Sparkfun, and also some of their ESP8266 ones. And this message is sponsored by the union of bored Tusken Raiders. It's one of a suite of tools from the "B4X" group. B4R is Basic for Arduino. Write the code in a very powerful modern Basic and it churns out C code for Arduino or the ESP devices (and NodeMCU). I plan to use it for my ESP32 stuff because I don't want to use Python and the last time I checked, the Python guys still hadn't gotten BT working on the ESP32. So is B4R an IDE? You can write for Android, iOS, Mac, Windows, Linux, Arduino...etc. So, does B4R run on Windows 10? Please don’t start any ranting about Windows vs Mac vs Ubuntu vs Linux. ESP32 only. Yes. Pay very close attention to the installation process re Arduino IDE, etc. Do not try to use the current beta ESP8266 Arduino library - off the top of my head I think the last stable is 2.4.2. B4R works as advertised on both Win 10 Pro and Linux 18.0.4LTS in my short several month experience with it. There is a healthy forum that is quite helpful and their search function works well. Thanks! Any links as to the download location? How is Arduino IDE involved? Yup, you need the Arduino IDE. B4R = "Basic for Arduino". I was hoping to avoid Arduino. If you set up the install as they direct you don't have to interact with the Arduino IDE at all. It's not all that bad an environment and the devs and forum members are very, very helpful.